Mockridge Tour – a cycle ride around points of significance in and around Geelong. 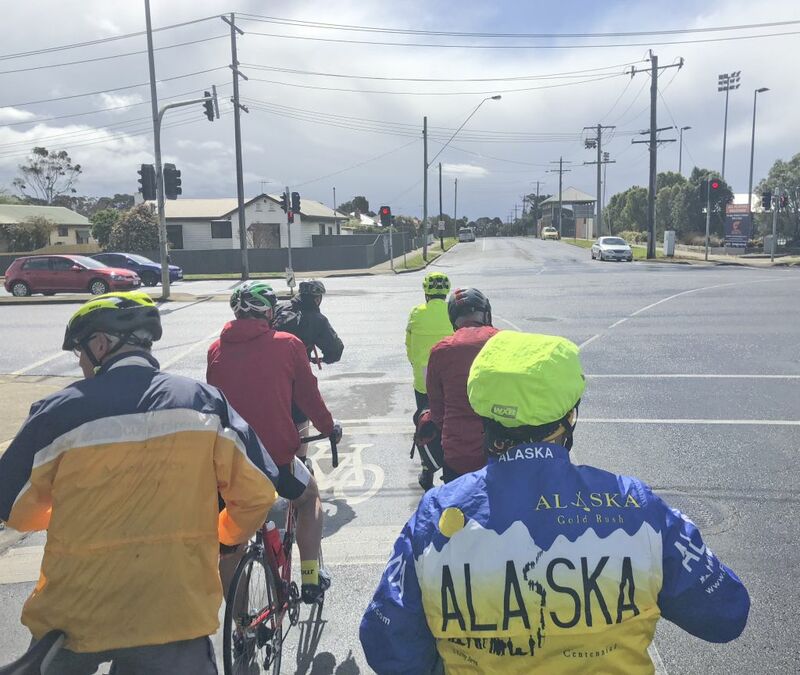 Doug Merritt, of Cycling Geelong, led about 20 riders from Balyang in terrible conditions – rain, cold and wind – for a tour of Geelong visiting places about the city which connected to the life of Russell. The were participants from Cycling Geelong, Life Activities Geelong, Geelong Touring Cyclists, Geelong Cycling Club and visitors from out of town. Also in attendance were Johne Hine, a local Olympian and Russell Mockridge’s nephew, Robert Mockridge. From Balyang, the tour took the river path to the steep zig-zag to Pakington Street. All but an agile and fit few, including GTC’s John Hagan, walked the zig-zag. Thanks to Ray Bowles (The Cycling Scrapbook) for the two photographs above. The first stopping place was The Geelong College, where participants were treated to a tour of the old school, including the hall of famous ex-students, where Russell’s photo features. From there, a detour to near St Joseph’s showed participants the type of hills Russell could have used for training in Geelong. 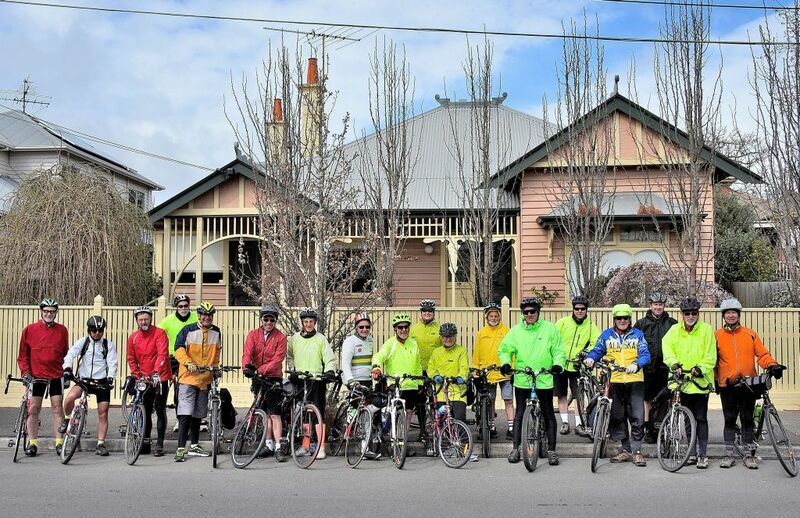 Next the tour wended it’s way to Russell’s family home in Roebuck Street, before cycling part of the proposed east-west cycling corridor, along Villamanta Street, and to the Geelong Library and Heritage Centre over the cycle bridge over the railway line on Little Malop Street. Thanks to Ray Bowles (The Cycling Scrapbook) for the photograph above. Here, the participants had the opportunity to view a historic display about Russell at the Heritage Centre, and take a refreshment break at the newly opened Cafe Public. As the tour wound its way back to Geelong West, the clouds that had been hovering all morning, became black and angry. The wind intensified as the group entered the Geelong West Football ground, to cycle the velodrome and hear more about Russell’s racing in and around Geelong. The storm broke with a tree-bending south-westerly gale, and icy horizontal rain. Shelter in the grandstand was more than welcome. Thanks to John Hagan for photographs. This entry was posted in Best Rides, Cycle racing, Cycling events, Cycling history, Ride reports and tagged Geelong West Velodrome, John Hine, Russell Mockridge by hlyth2013. Bookmark the permalink.